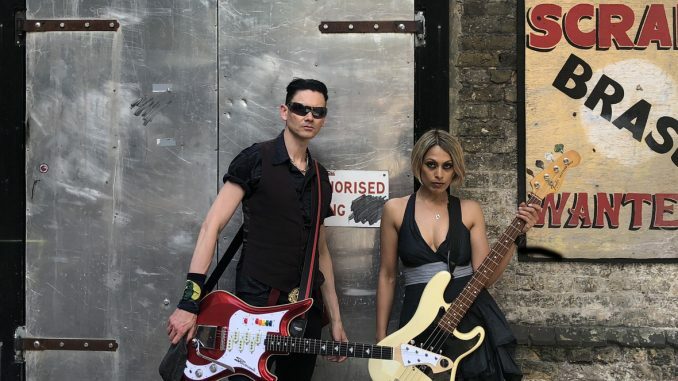 The solid, almost electric pulse that zaps you comes together when guitarist Will Crewdson (Adam Ant, Bow Wow Wow, Rachel Stamp) and bassist/vocalist Shaheena Dax (Rachel Stamp) come together. Its as if time stood still and their sound captures a moment of time and sends the brain cells into a film scene of dark electro-rock waves. Certainly, without question, their latest EP ‘Drenched’ is to date their music sound identified. London is sending out some major rock through the crowded foggy streets, clubs, and dives and it is the music of She Made Me Do It. David Zell: Hello Will and Shaheena thank you for talking with us today. Introduce yourselves, please to our readers. We are She Made Me Do It from London, UK. Shaheena Dax on vocals and bass. Will Crewdson on guitar and vocals. Joe Holweger is our drummer for live gigs. David Zell: How is working together on this current project different for the both of you than it was in Rachel Stamp? It’s different for me because I was the keyboard player in Rachel Stamp so most of my ideas were keyboard/piano based back then – now I’m writing lyrics and vocal melodies, and coming up with ideas on my bass guitar. I also think that we are working faster and constantly coming up with lots of new ideas all the time. DZ : Plans to take this EP ‘Drenched’ outside the UK and perform this year? Will there be older music on the playlist from Rachel Stamp days as well? We are playing in the U.K. and in Europe over the next few months and we’d definitely love to tour more for sure. We have covered a few songs from bands that we like such as The Divinyls, The Cure, The Nymphs, Matthew Sweet… I’d personally never thought of doing a Rachel Stamp song in our set because I think it just wouldn’t be the same without David singing them. DZ: Overall would you say you are both performers or closet loners writing new songs? A bit of both maybe…I’ve performed in front of audiences since the age of four but I love reading in bed and traveling alone. It changes every day. DZ: Over the last few years we have lost some of the most influential musicians of our time. Who have been some of your favorites that are now gone, and what did they leave you as musicians? I think the deepest loss I felt was for Tom Petty as I grew up listening to him and feel a real link to a lot of the music he put out in his lifetime. My good friend Nick Marsh of the Band Flesh For Lulu was a big loss too. Always one of my favorite vocalists and people and I’m glad I had the pleasure of working with him a bit towards the end. Just last week we also lost Ranking Roger who I toured with over the last couple of years when The Beat were on the same bill as The Selecter who I also play guitar with. He was such great energy and an all-around lovely bloke. DZ: In late April you will be sharing the stage with Altered Images, how did this opportunity come about? A friend of ours suggested it and we contacted the agent involved and here we are. DZ: Then in May you have a punk festival on the books. Would you say SMMDI fits into today’s punk sound? 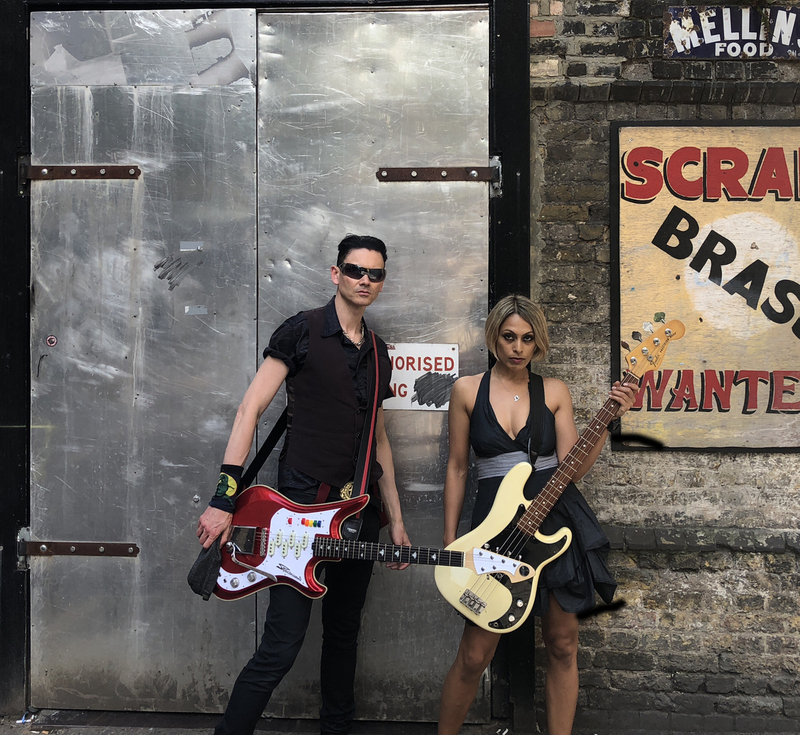 We love so many different genres of music and we are inspired by all of it so I think we fit in with lots of different styles – electro, rock, punk, new wave, grunge…I like that we’re a blend of many things and that our music keeps evolving/developing naturally. DZ: Every track on this EP is cutting-edge a stick of pin to the heart “Frantic” in ways kicks back to Blondie days. Then again “What’s Going Down” kicks those 80’s synth wave tones… almost a Depeche Mode languishing overs the foggy castle moors. This EP is so much more than just “Bones”. How did you reach the decision to release “Bones” as your first single/video? I’m glad you’re mentioning bands that we like and that you’ve been attentively listening to our music – thank you! Each song comes from a totally different place of inspiration, all very subliminal in a way as we don’t really think about it when we’re writing. ‘Frantic’ is exciting to play live because of the riff, the pace, the short rap…The video is an amazing animation by Jeff Conway at Pushing Normal – I really love it – we all developed the story together and he then came up with this super cool vid. ‘What’s Going Down’ feels like an intense storytelling moment when we play it – the lyrics are about a state of confusion and disappointment with a splash of disbelief, despair, and anger thrown in – a pretty dark and desolate place. ‘Bones’ was chosen first because we wanted a live performance video to accompany the release of the EP – Duncan Catterall directed it – we love working with him – we’ve made quite a few videos with him now. It’s dark and heavy, driven by themes of obsession and seduction – it’s the first video to establish our live setup and we wanted to give out an exciting little taster. We have just filmed a video for ‘Broken Morning’ with Duncan again in a beautiful Georgian studio with lots of natural light and he’s editing it just now so it should be out soon. After that, we’ll shoot a video for Ashes with him. DZ: What is your relationship with Catranstic Records, how did you connect? Haven’t you released two other albums under them? It’s our label so we were born connected to it like a musical umbilical cord. We’re happy to stay in control as much as possible and Catranstic gives us the freedom we need. DZ: Taking the past songwriting and releases and compare them to the present EP and writing do you sense that you are heading in a direction that feels more like SMMDI? Absolutely – I think our latest EP is our best yet. Also, now that I’m playing bass and that we have a live drummer, it all feels great – back to our rock’n roll roots in a way with a good dash of electro in the mix. DZ: Are there any plans to bring She Made Me Do It to North or South America any time soon? We sure hope so – we have more songs to write and want more gigs to play.